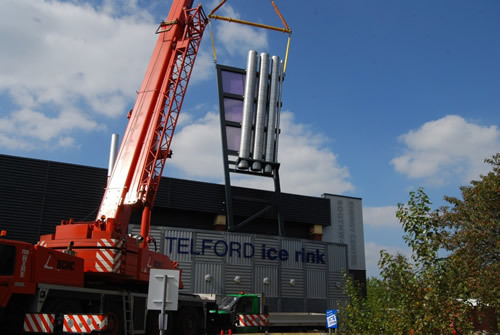 Client to have new boilers and CHP plant installed at Telford Ice Rink complete with new flue systems discharging above roof level in accordance with the Clean Air Act. The final confirmed discharge height above roof level resulted in a requirement for a structural mast support system, that Midtherm developed with the architect to produce a bespoke support system complimenting the existing building. Developed from co-ordination drawings and our site surveys, Midtherm were able to provide a tilted mast solution to the approval of the architect (conceptual photomontages assisted with the approval of the design). The mast was designed to fix to a bespoke reinforced foundation base and also fixed back to the building at a higher level to minimise the impact of wind loading, enabling us to select reduced steelwork section sizes. The flues were factory mounted onto the mast structure so that the entire external flue and support system could be craned into position on site in one day. 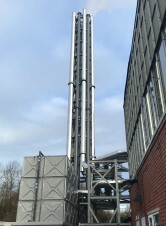 The internal interconnecting flues were then connected up from appliances to the external mast structure. Midtherm also designed and installed the wall cover penetration plate. Client had to have existing boilers replaced over a weekend to ensure continuation of heating during the heating season. The old boilers were pressure jet, and the combined flue discharged into an unlined rectangular chimney stack. With the new boilers being condensing, the chimney had to be lined, and the rectangular dimensions made the use of standard circular liner impossible. Having surveyed the boiler room with the existing boilers and flue in place, positions of new boilers, pipework and flue header were agreed and the flue manufactured in time for the weekend works. Inspection at the bottom of the chimney showed the rectangular cross-section of the chimney, and Midtherm Engineering’s Furanflex composite liner was manufactured. On the day of the work, the liner was lowered into the chimney stack from the temporary scaffolding. The liner was then suspended from the lifting beam at the top of the chimney using the Furanflex installation kit, and then inflated before being camera surveyed to ensure it was free from twists. Once in the correct position and orientation, the liner was pressurised and heated using steam generators to begin the curing process. After several hours of careful monitoring, the liner was cured and the final connections could be made to the flue header. During this time, the new boilers had been positioned and piped up to the system, meaning that the entire boiler and flue change had been carried out in one long day. The client was delighted with the results and our efficient co-ordination. 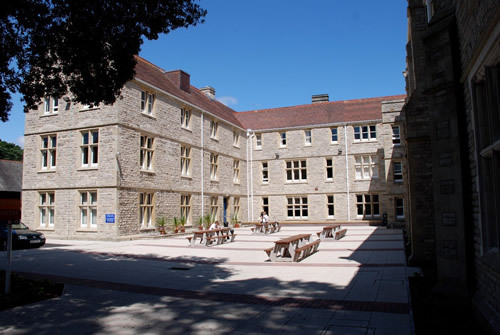 University of Warwick was in the process of making significant changes to its campus which required the University to increase the discharge height of the existing Main Energy Centre flues. Midtherm Engineering completed photo realistic visualisations, dispersal modelling, structural and civil design works, pressure testing and design, manufacture and installation of new flue systems, mast structure and steel gantry. The work was all to be completed within a tight timeframe to facilitate the opening and commissioning of the new building. Construction of the Zayed Centre for Research into Rare Disease in Children began in 2015. 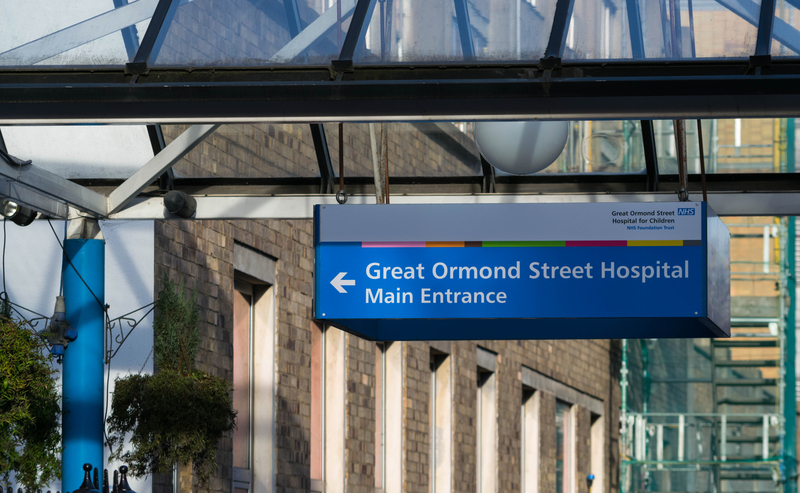 The new centre will be the world's first purpose built centre dedicated to research into rare disease. Midtherm Engineering Ltd were appointed by Skanska in October 2017 to carry out the design, manufacture, installation and pressure testing of the new boiler and CHP flue systems required to provide heating for the centre in London.